Very Good. 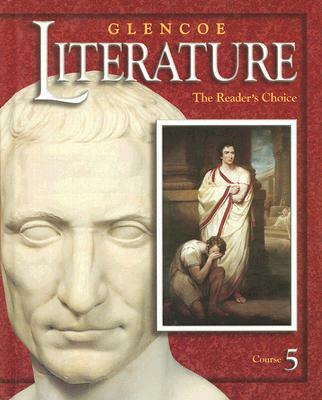 Glencoe Literature: The Reader's Choice: Course 5 by McGraw-Hill Education. Text in English, Spanish. Sewn binding. Cloth over boards. 1085 p. Contains: Illustrations. Glencoe Literature. Intended for a young adult/teenage audience. Good. Glencoe Literature: The Reader's Choice: Course 5 by McGraw-Hill Education. Text in Spanish, English. Sewn binding. Cloth over boards. 1085 p. Contains: Illustrations. Glencoe Literature. Intended for a young adult/teenage audience. Fair. MULTIPLE COPIES AVAILABLE! Glencoe: Literature, Course 5-Student Edition [Hardcover]. Copyright-2002, ISBN: 0078251095. These books are in ACCEPTABLE condition with the interior pages and bindings intact, and CONSIDERABLE wear to the exterior covers! We ship daily, Mon-Sat. Customer service is always our top priority! WE WILL NOT PROCESS INTERNATIONAL ORDERS! These orders will be cancelled automatically! Thank you! ! Fair. 0078251095 MULTIPLE COPIES AVAILABLE-COVER IS TATTERED WITH EXPOSED CARDBOARD-May contain school stamp and student names-May have writing and highlighting-DOES NOT INCLUDE ANY CDs OR ACCESS CODES IF APPLICABLE. Good. 0078251095 No CD Included. Access code may be previously used. Moderate dirt wear, wrinkling or creasing on cover or spine. Good binding. Moderate writing and highlighting. Cover has used book stickers or residue. Marker on cover or bottom edge of book.